From running a rocky, shallow river in Northern BC on a remote hunting trip to enjoying a nice day out with friends and family, our visitors are here for one reason. They want to buy a jet boat so they can start creating their own adventures. We created the platform - You've got the boats, products, and services! Get Your Jet Boat Inventory, Parts Or Services In Front Of Buyers Right Now. 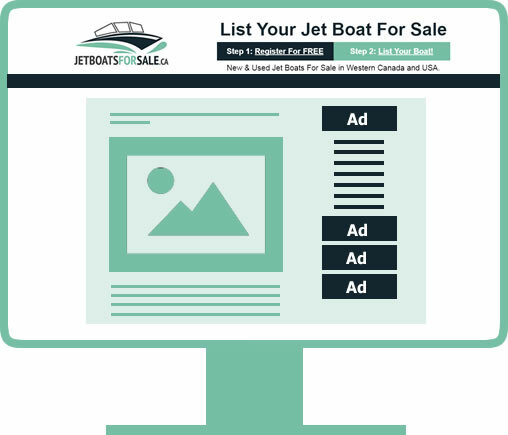 The primary focus of JetBoatsForSale.ca was to create an online sales platform for listing welded aluminum Jet Boats. 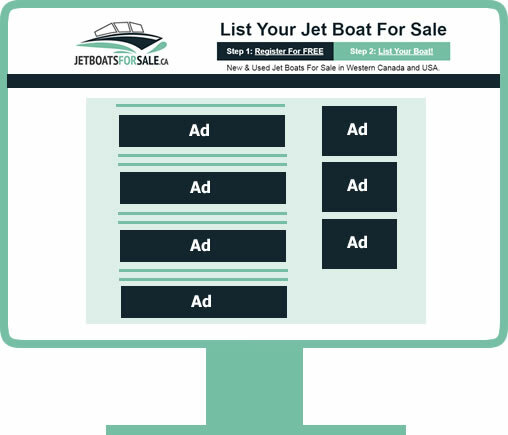 We wanted to create a place where builders, dealers, and private sellers could quickly list their jet boats for sale and get their boats or their brand in front of a targeted, "turn-key", audience, fast. We also wanted a place for jet boaters interested in buying to be able to browse the largest inventory of new and used jet boats for sale along with the parts and accessories they need to keep their boats running. Our targeted visitor demographic makes JBFS a perfect match for any business that is providing services or products to the jet boating industry. Our website will be the least expensive, most productive member of your sales team. It will never call in sick and it's up 24/7/365 advertising your inventory, services and products to jet boaters. Your Inventory Will Look Great On All Devices. Our homepage ad placements offer excellent exposure on our websites busiest page. Advertise your company or products in the sidebar of actual boat inventory listings. Advertise in our parts and accessories section. Winches, engines, pumps, heaters, UHMW. We include a dedicated brand page for all of our advertisers. On your brand page you can showcase your company and products to jet boaters. 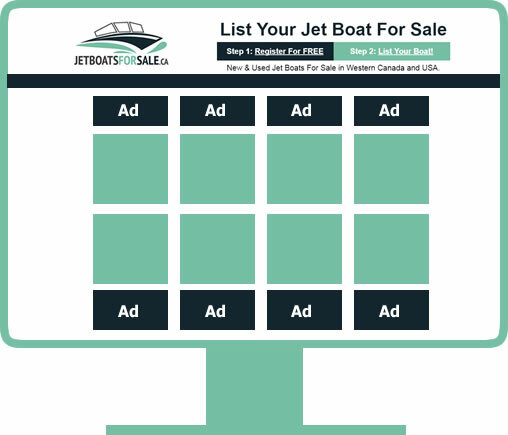 In the case of a builder or a boat dealer you can also have your jet boat inventory displayed on your brand page if it's listed on JetBoatsForSale. Brand pages are exclusive. Your brand page will only display your products or in the case of a boat builder your affiliated dealers. Brand pages will not display competitors ads. How Much Traffic Do We Get? Generating good quality web traffic takes a lot of work and effort. We've spent the last year developing reliable streams of targeted jet boating traffic. Do You Know The Real Cost Of Your Web Traffic? For a business to buy the traffic we're already generating for the Jet Boat industry it would cost $.70 cents per click on average and we're generating clicks from hundreds of jet boat for sale keyword phrases. To buy the equivalent amount of targeted traffic through Google Pay-Per-Click you could expect to pay over $2600 per month! The real cost to you is the cost of lost opportunity by not piggy backing on our traffic. These statistics are from January 1st 2018 - June 30th 2018. Our website is heavily promoted in Search Engines and Social Media. We are a small team of web marketers located on Vancouver Island. We specialize in lead generation through proper search engine optimization. These are visitors from Google, Yahoo, And Bing searches. We promote our website and listings on our Facebook page. This is referral sites such as Kijiji, Craigslist, Scott Waterjet and More. Some Example Search Phrases People Use To Find Us. This is a small sample (40) of some of the more popular keyword phrases you'll find www.jetboatsforsale.ca in Google, Bing and Yahoo. In most cases we're ranked in the top 5 and usually always on the first page of results. While most jet boat builders or boat dealers are stuck promoting their own brand keywords in search engines and on the Internet our website is a "marketplace" and focuses on Jet Boats in general. This allows us to be nimble and dance around hundreds of different keywords and phrases related to the different types of jet boats, builders, models and brands. Someone may come to our website with intent to research and buy a boat from brand A because their buddy has one only to fall in love with a boat from brand B instead and then ultimately ends up buying a boat from brand C after what seems like endless test drives. The fact is you don't know what a buyer is going to do until they're "ready to go" and if your boats aren't in their field of vision, it's one less opportunity at a sale for you. Searched A Particular Make/Model "Jet Boat For Sale"
Based on their search query including "for sale" they have qualified their "intent". They are very likely looking to buy a boat and doing research. These visitors came back for a repeat look at a particular boat or several within 24 hours of their first visit. They are more serious buyers. 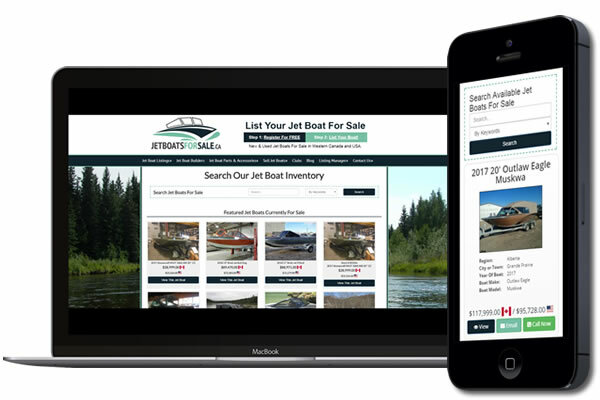 For most jet boat builders or dealers they need to optimize their website for their own particular makes/models of boats. Because we're a marketplace we can optimize our website for every single jet boat make and model. This increases our traffic exponentially and also your exposure to potential customers who may have never heard of your brand before. We place a heavy emphasis on acquiring traffic from Social Media. When a new jet boat is listed on our site for sale or a new advertising partner is acquired we announce it on our Facebook page. This can sometimes result in a boat or post going viral and getting shared to hundreds or thousands of people. These demographics are based on statistics acquired through Google Analytics and Google Search Console. Our visitors are almost exclusively male. The primary purchasers of Jet Boats and Accessories. 92% of our visitors are of the age to make large purchasing decisions such as buying a jet boat. It's males aged 25-65 that make up more than 90% of our Internet traffic according to Google Analytics. This is also the demographic group most likely to purchase a jet boat. Our website is used for market research along with the hope they'll find a great deal on a particular make/model of jet boat they've been wanting to buy. Our USA visitors are coming primarily from Washington State, Idaho, Oregon and Montana. The most likely time a boat owner is going to buy products and upgrades for their boat is during their first few months of ownership. Our web visitors have expressed an interest in buying a jet boat and are likely going to be purchasing parts and accessories as well. Engines (repowers), pumps, impellers, winches and recovery gear, heaters, and more. We offer an excellent platform for you to get your jet boating parts, products or services in front of the jet boating crowd. 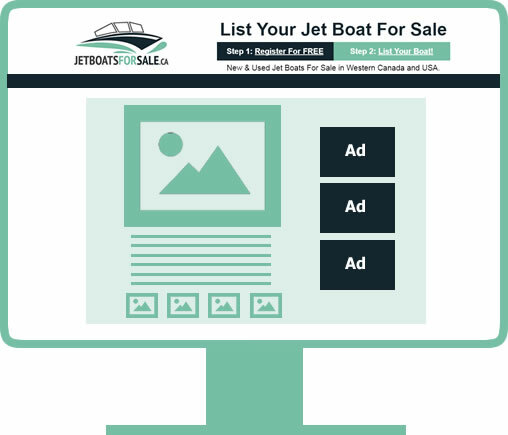 Our website offers an online platform with traffic already in-place to get your inventory viewed by prospective jet boaters looking to buy, sell or get into their first jet boats. Many of our visitors want to buy a jet boat and it's quite likely they can't name more than 3 or 4 builders when they first become interested in the sport. We offer a turn-key way to get your inventory in front of people who've raised their hand and said they are interested in purchasing a jet boat! We'll Share Or Post Your Company News Related To Jet Boating.